A prominent Russian opposition activist has been hospitalised with organ failure, two years after he almost died of suspected poisoning. 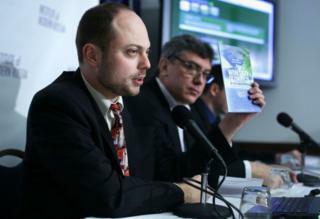 Journalist Vladimir Kara-Murza, who works for pro-democracy group Open Russia, fell ill at about 05:00 local time (02:00 GMT). Mr Kara-Murza's wife told the BBC she was on her way to hospital where her husband is in a medically-induced coma. The activist nearly died when he suffered sudden kidney failure in 2015. "He is already on life support and in a medicated coma. It's the same clinical picture [as last time]," Evgenia Kara-Murza told the BBC. "The reason is unclear like last time. He's been active and healthy [recently]." The journalist's wife said he had suffered the same sudden onset of symptoms as in his previous illness. "The ambulance took him directly to the hospital where the same medical team has since been trying to determine what is happening," she said. "He was brought there conscious but was put in a medicated coma and on life support later, because his organs began shutting down like last time." Mr Kara-Murza had spent the previous evening at the home of his parents-in-law. On Wednesday he had posted a Facebook tribute to his friend Boris Nemtsov, an opposition leader and former deputy prime minister of Russia who was shot dead in February 2015. Writing in Russian, he shared a photo of roses on the Bolshoy Moskvoretsky Bridge where Mr Nemtsov was killed, and the words: "We're here. We remember." No cause was ever established for Mr Kara-Murza's last illness, but tests confirmed that he had ingested a poisonous substance. Then aged 33, he was in a coma for almost a week and struggled to communicate when he regained consciousness. Fears were raised that the journalist could have been deliberately poisoned. In 2015, the chief doctor at the Moscow hospital treating Mr Kara-Murza told the BBC that tests had revealed traces of an anti-depressant. He speculated that the citalopram, which the activist was taking, may have accumulated in his body if he had a prior, undetected kidney problem. It may also have reacted with an antihistamine Mr Kara-Murza used for hay fever. His father rejected that theory, saying he did not believe an innocuous nasal spray could have triggered the "nuclear explosion" in his son's kidneys.